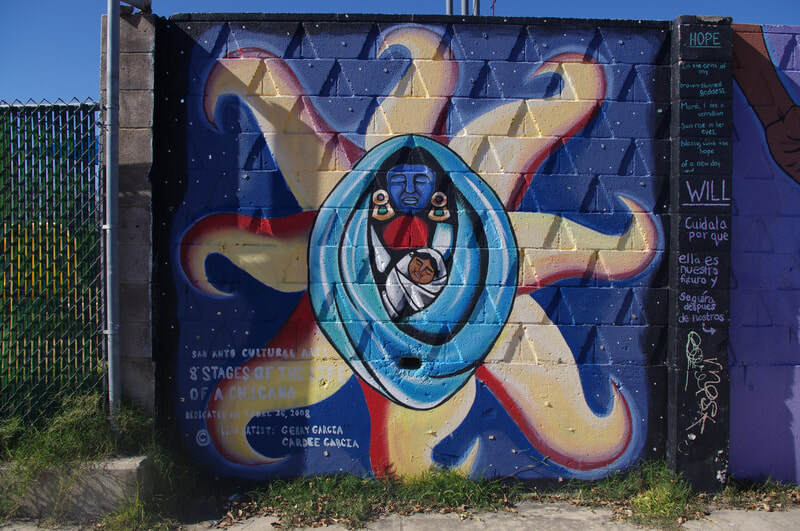 Painted on eight different sections of a fence on Trinity Street, Eight Stages in the Life of a Chicana tells the life story of a chicana from the Westside. Cruz Ortiz designed the original mural in 1995 and Gerry and Cardee Garcia updated the mural in 2004. Gerry and Cardee stayed true to the original design but made some edits to emphasize the chicana’s strength, such as by raising her fist in the fourth panel and making her portrait more prominent than her vato’s in the sixth panel. The biggest difference is in the eighth panel, which originally showed the chicana and her comadre drinking coffee on the front porch. 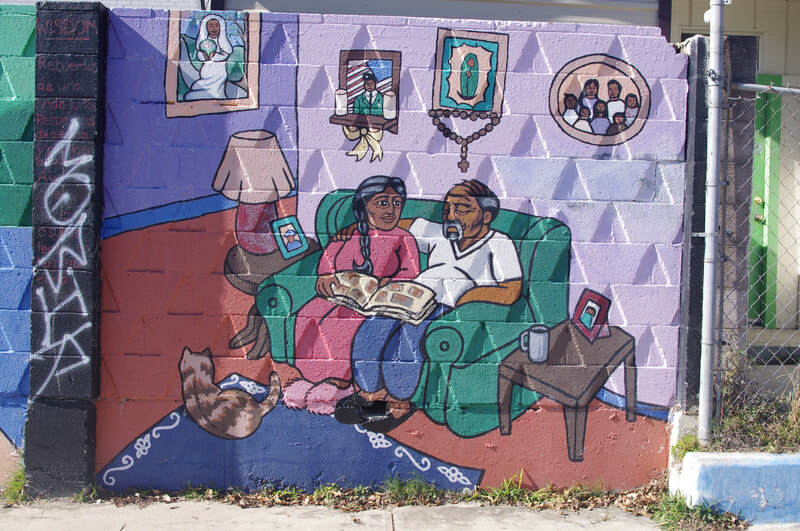 A happily married couple, Gerry and Cardee changed the image to show that the chicana and her husband grew old together. 1. 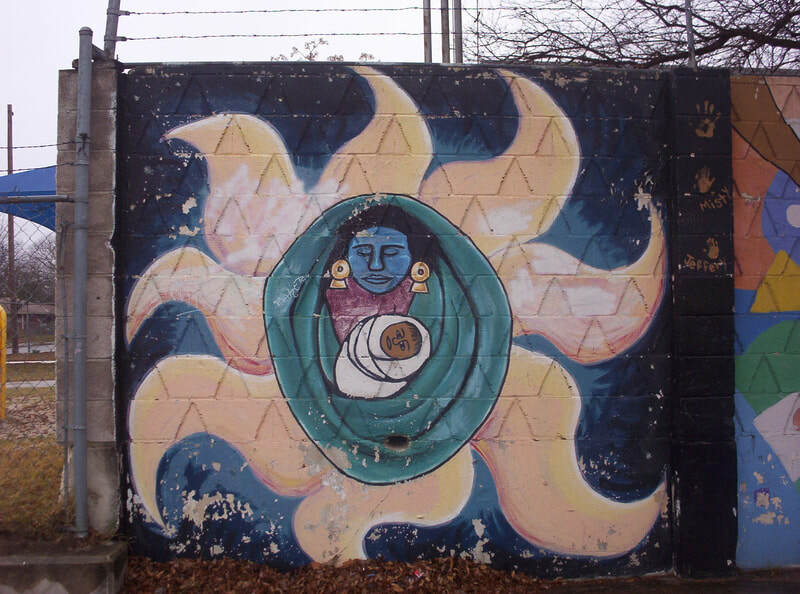 Birth: Before birth, the chicana is held in the heart of Mother Earth. ​2. 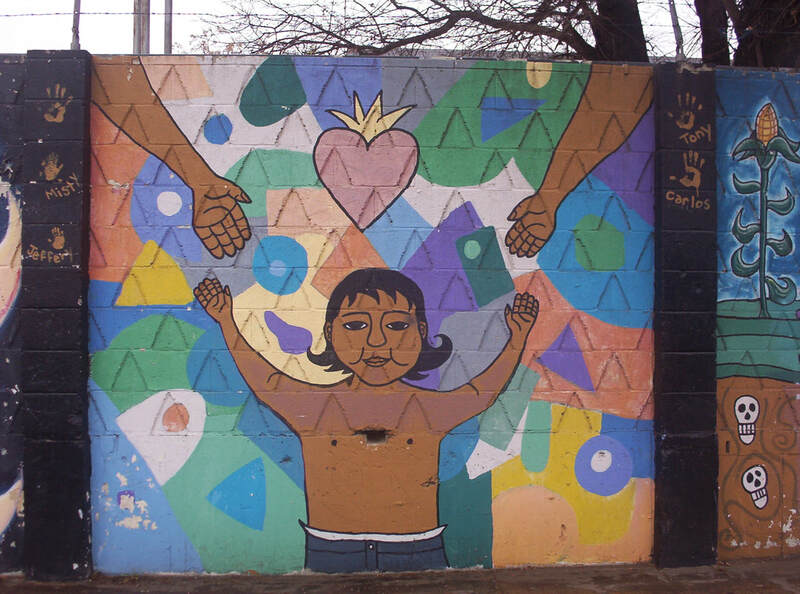 Childhood: The chicana grows with the love of her parents. 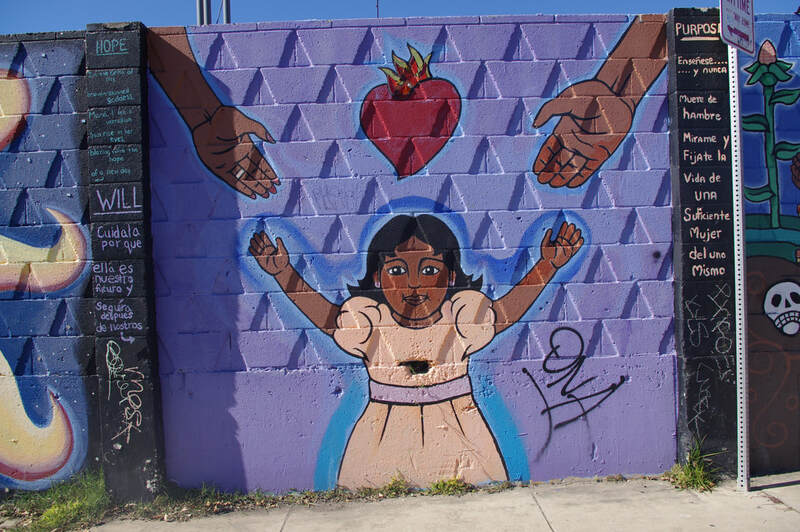 In this panel, her mother’s and father’s hands reach towards her and the sacred heart hovers above her head, a sign of blessing and protection. ​3. Learning her roots: The chicana watches her abuela plant seeds. 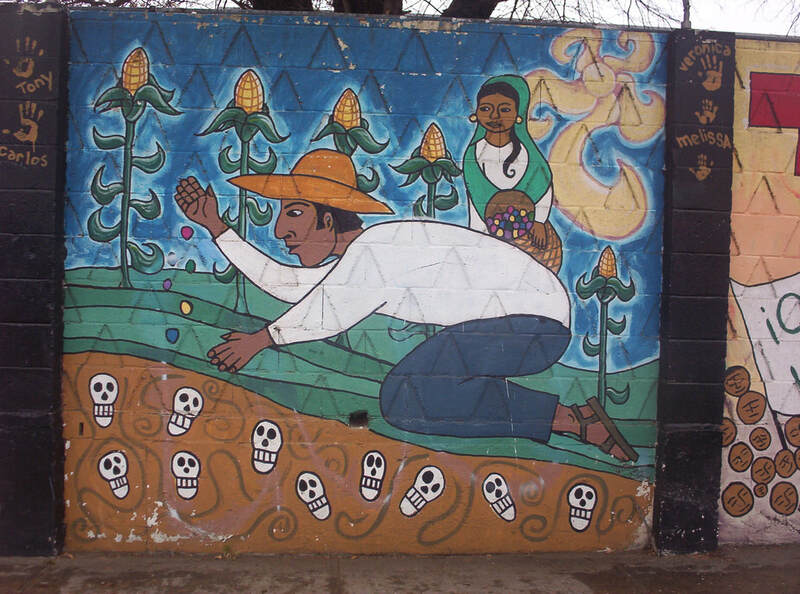 The calaveras buried in the soil represent the ancestors, who bring life to the next generations. 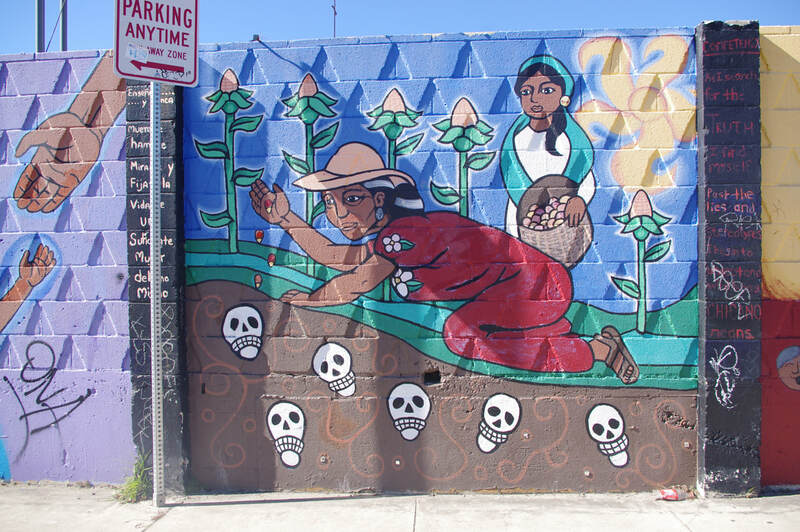 This life is represented in the maíz plants that nurture the chicana and her family. ​4. 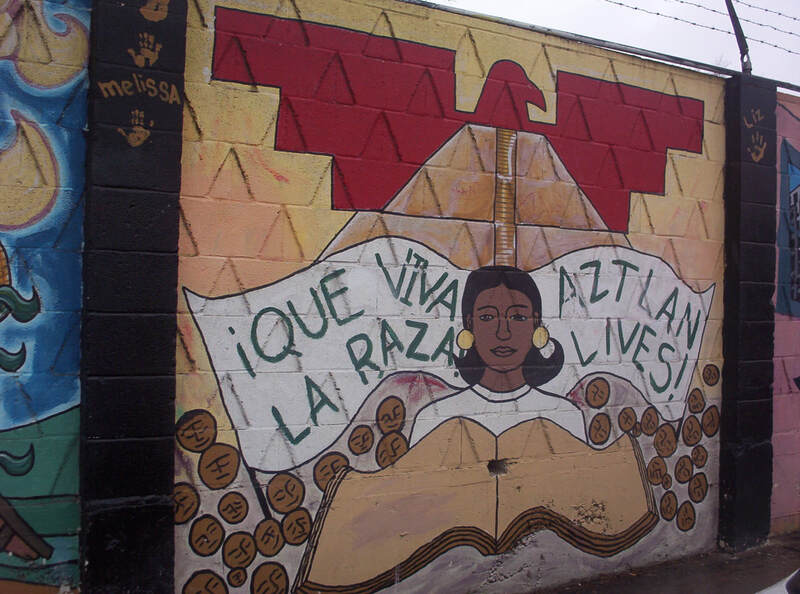 Politicization: The chicana is a student becoming conscious of her identity, a process of education represented by the book in front of her. 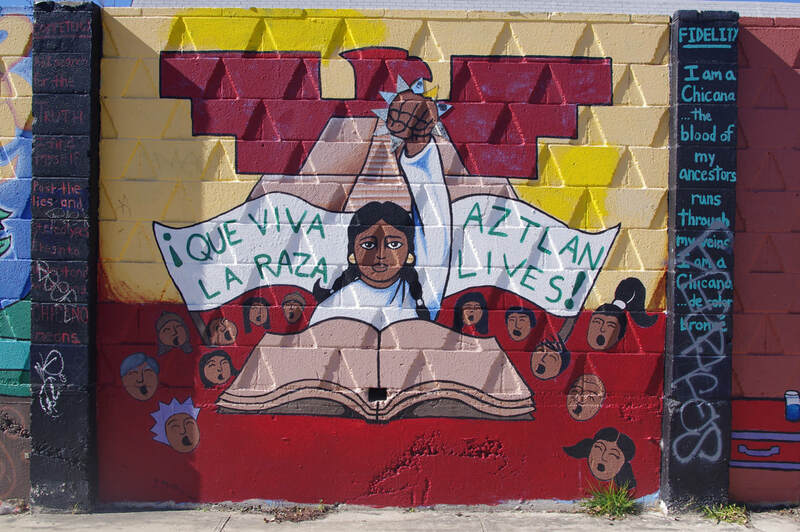 She is proud to be brown and raises her fist as she becomes a leader for other chicanas and chicanos. An Aztec temple and United Farm Workers (UFW) flag stand behind her. ​5. 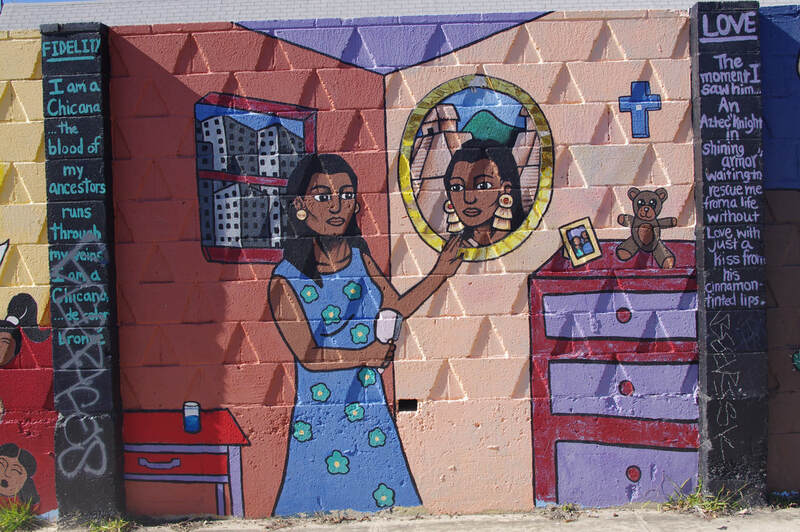 Identity: The chicana has finished school and is now living and working in an urban space. 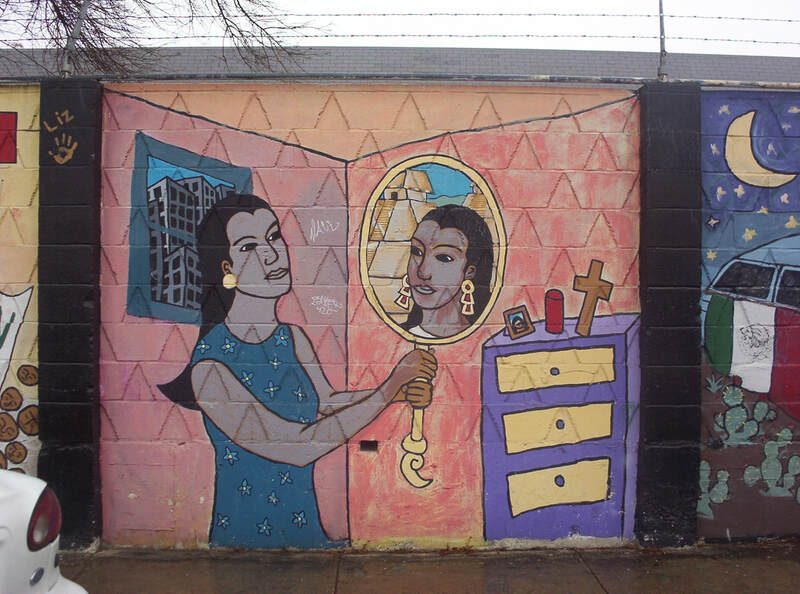 When she looks into the mirror, she sees her heritage as an indigenous-Mexican woman. ​6. 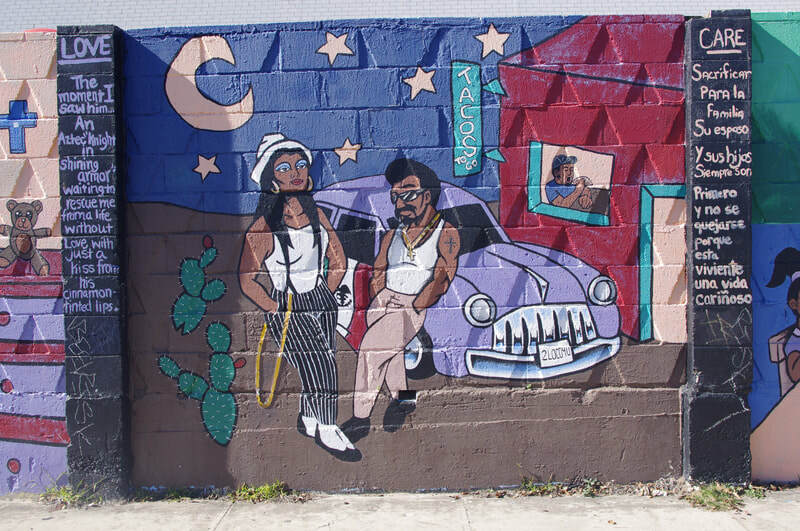 Falling in love: She stands with her vato next to a lowrider and a taqueria, finding power in her own beauty. ​7. 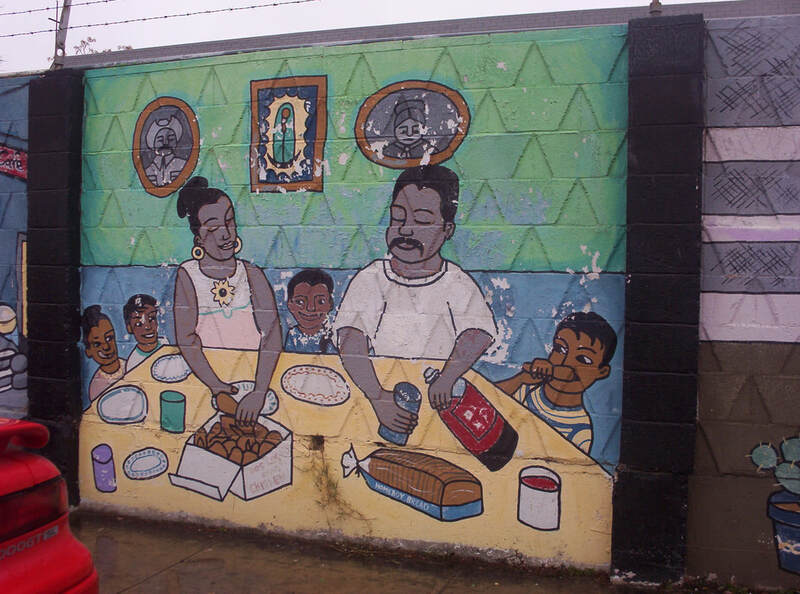 Raising a family: The chicana and her young family chow down on the classic Westside meal of Big Red and Fred’s Fish Fry. ​8. The wisdom of age: The chicana and her husband sit on their sofa underneath family pictures and La Virgen de Guadalupe, happily reminiscing over a photo album. The “photos” in the album are actually pieces of mirror, allowing viewers to see themselves in this story. 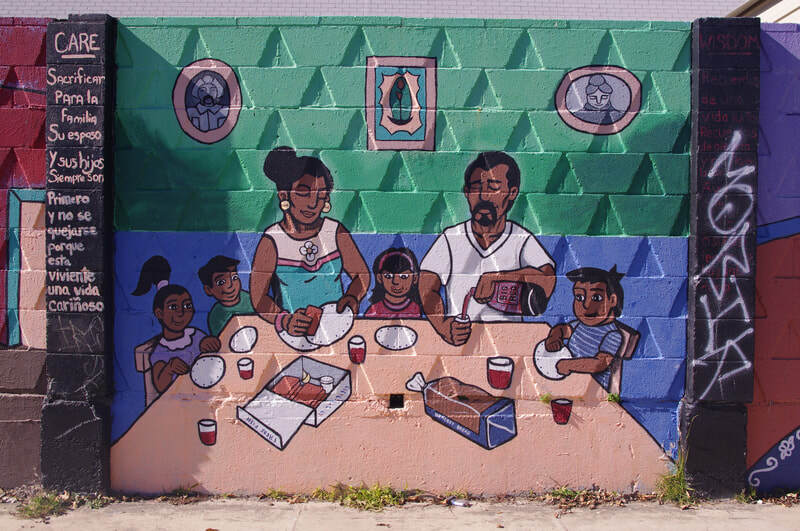 To address some fading and tagging on the mural, Adriana Abundis lead a group of middle school students to refresh the mural in 2017. This restoration left the design in tact, but brightened up the paint with Novacolor and clear coat. Not legible due to graffiti damage. 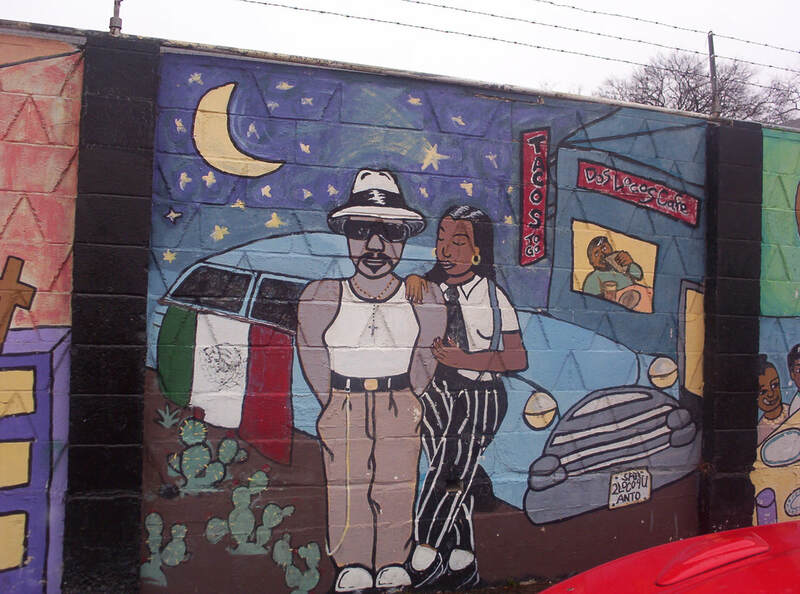 ​Gerardo Q. Garcia and Cardee A. Garcia were both born in San Antonio. They were both involved in theatrical, artistic, and extracurricular activities throughout high school, and both belong to families of artists. After graduating in 1998, the couple got married. Gerry became a professional tattoo artist and began to pursue his Bachelors degree in Art with a minor in Drama from Our Lady of the Lake University. He successfully completed his studies in May 2003, due in great part to the love and support of his wife and partner Cardee. Throughout Gerry’s years in college, Cardee was forever by his side, learning and refining her own artistic skills as well. 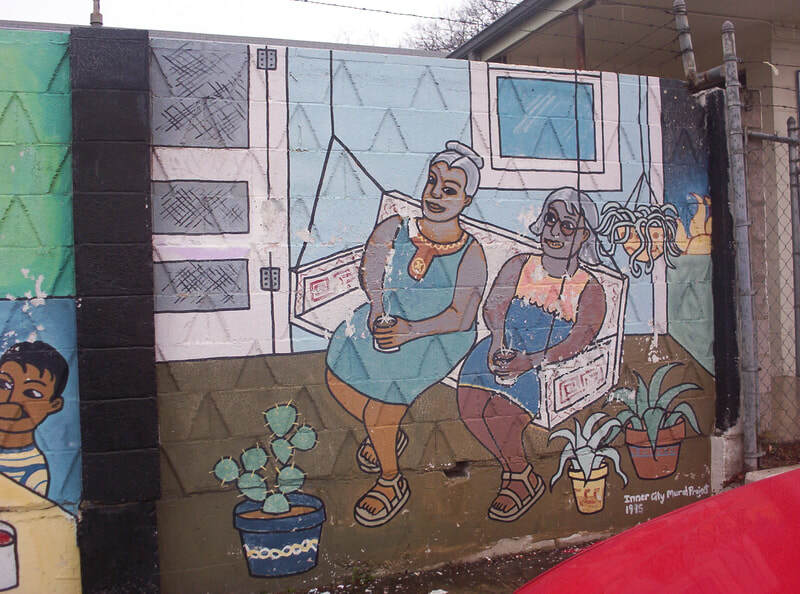 Gerry served as San Anto Cultural Arts’ Community Mural Program (CMP) Coordinator from 2006-2009. Gerry and Cardee have been instrumental as volunteers and crew members in producing numerous murals for San Anto, including Cultura y Revolucion, Dualidad, Raza Unida, Lideres de la Comunidad, You are not Forgotten, Brighter Days, Trinity St., All the Difference, La Musica de San Anto, and El Poder de Muralismo: Cuentos Son Arte. Now the couple works together at Calaveras Tattoos on St. Mary’s Street.